Well, not exactly useful. But it turns out that we can do better than that with a little work. The lm-sensors wiki page about voltage labels and scaling describes a simple method by which one may make sense of their motherboard’s sensors. My motherboard’s sensors chip model is IT8721F, which measures raw values ranging from 0 to 3.06V in steps of 12 mV (8 bits of precision). In order to fit its range, voltage rails such as +5V get a scaling factor. Our job is to figure out which is the scaling factor and which input of the sensor is measuring it. The +3.3V sensor had already been correctly named by lm-sensors (in3). The Vcore sensor (CPU) is quite easy since it’s not scaled (in2). +5V and +12V are the tricky ones. As you can see on the snippet above, I’ve sorted the samples I’ve collected and calculated the differences in mV between them. Looking at the +12V samples first, we see a pattern of alternately adding 51 or 52 mV, thus we deduce that the measurements have steps of 51.5 mV between them. This works out to a scaling factor of 51.5/12. The +5V is analogous and we calculate a scaling factor of 21.5/12 for it. Then I’ve booted into my Arch Linux and took the raw data from lm-sensors (pasted at the end of this post). Based on it, I guesstimated that in0 corresponds to +12V while in1 corresponds to +5V. This leaves us with in4 to in6, which I chose to just ignore. And, finally, it seems that the temperature reported by the k10temp isn’t real temperature, instead it’s a relative temperature. It’s mostly meaningless since the motherboard correctly informs the CPU temperature. label temp1 "CPU Temp (rel)"
I’ve posted the configuration snippet above to the lm-sensors mailing list as well, so hopefully it will make it to the lm-sensors configurations wiki page :). 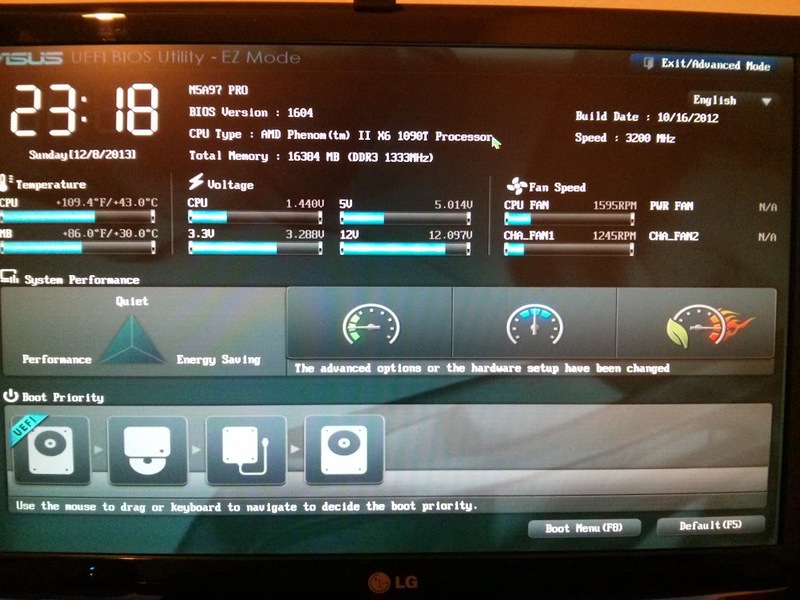 This entry was posted in Hacking and tagged asus, bios, linux, m5a97, sensors. Bookmark the permalink. Muito interessante, Filho, sua descoberta e solução para o problema. O post ficou muito bem feito também. Abração! Many thanks Felipe. I have an Asus M5A97 R 2.0 mobo, and have used your file as a basis, setting useful alarm limits. Well, the step is not exactly 51.5; multiply 51.5 by the factor “12.200/12.2055″. This correction is below 0.1%; practically useless in view of the tolerances of the resistors (1-10%). However, a theoretical mind may observe that the value “12.200″ is a rounded number, corresponding to the interval [12.1995, 12.2005), so that the step also becomes interval-valued. (Other roundoff errors in this problem are much smaller.) Now repeat the procedure using, instead of “12.200″, every other given “12V” BIOS reading; each time we obtain an interval-valued step; the common interval of all those intervals (their “intersection”) would compise all possible values of the step for 12V, given these facts. what is the impact for this case?